Second copy of My Ishmael. 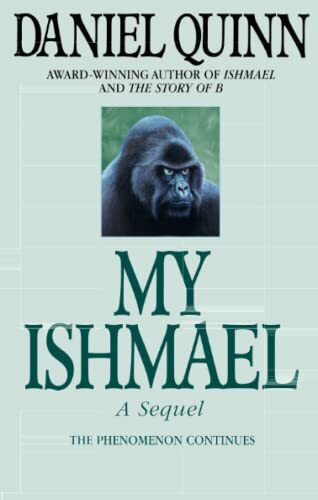 "My Ishmael" has the same format as "Ishmael" - one of the ape's pupils, "with an earnest desire to save the world" writes about her experience with the teacher. The only thing I am interested in, actually, are the teachings, and in this book there was not much new to me. Maybe because the things discussed here have been on my mind for a long time, I guess I had discovered most of them by myself already. And then the story veers off on a course, which took me a while to discover the meaning of. I finally understood, some days after having finished the book. But when reading it, I was earnestly wondering what the heck Daniel Quinn was doing. "Ishmael" shook my world. So did "Beyond civilisation". I have changed. "My Ishmael" was less earth-shattering to me, although I have recognised myself in Julie, in her feeling of not belonging. I cried when she did, and for the same reason. I have had the feeling of not belonging here, and now I understand why. Because I dó not belong here. Nobody does. This world which we have built, is not where people should be. It is a world for business, where people are bound to be unhappy. Anyway, "My Ishmael" has left me with a sense of deep unrest and I will make sure to find a way to deal with that. Highly recommendable, I would conclude. To Plinius, who might be ready for some more idea-shattering. Hey, I didn't expect this! What a nice surprise! Thank you, Biba89! yes, the feeling of belonging nowhere was and is as strong for me. Where Ishmael left me with a sense of unrest and even helplessness, My Ismael was more comforting to me, because of the suggestions made to Julie, about the small changes we can make in our lives. (Possibly I'm one of those people for whom you have to spell it out.) My Ishmael suggests to me that I'm on the right track with the choices I made, and the idea that the revolution we need is an individual affair speaks to me, because it validates what I try to do. Book was just delivered, am looking forward to reading it. It is funny how this book works. It mainly presents facts and ideas that, when you think about it, it's all too logical. However, "culture" (as the book calls it) has conditioned us not to think about it, not even to want to think about it. It's weird how that works. This book definately functions as an eye-opener in this way. I do feel that, somewhere along in the book, the "logical facts" are going on and on and on to a point where I personally felt I had had enough of it, that I got the point. Then, finally, when the story moves on to the finalizing part, I was able to quickly finish the book again. This book definately makes me curious about the other books on Ishmael, and I might want to track down some of em. Via Eto komt die boek bij mij terecht...bedankt Skoopmanschap! Ben benieuwd!! !